Zion Market Research has published a new report titled “Aseptic Sampling Market by Type (Manual Aseptic Sampling and Automated Aseptic Sampling), by Technique (Off-Line Sampling, At-Line Sampling, and On-Line Sampling), by Application (Upstream Process and Downstream Process), and by End-User (Biotechnology and Pharmaceutical Manufacturers, Contract Research and Manufacturing Organizations, Research and Development Departments, and Others): Global Industry Perspective, Comprehensive Analysis, and Forecast, 2018–2025”. 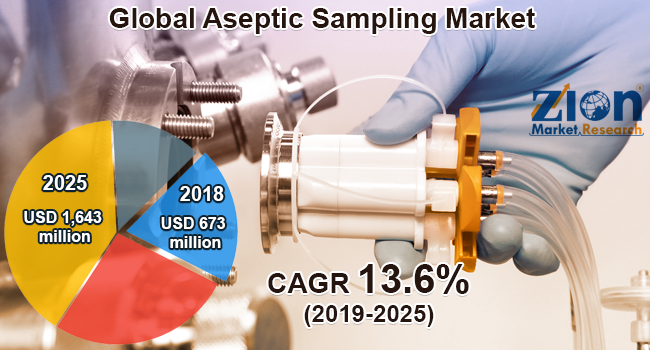 According to the report, the global aseptic sampling market was valued at approximately USD 673 million in 2018 and is expected to generate around USD 1,643 million by 2025, at a CAGR of around 13.6% between 2019 and 2025. Aseptic sampling is a sterile method for collection of a sample. It avoids product contamination and supports some observations related to a process or to validate a procedure’s result. The growing research activities in the field of biotechnology, rising development of biopharmaceutical products, increasing establishment of biotechnological and pharmaceutical companies, and rising investments made by the government for research and development activities are fueling the growth of the global aseptic sampling market. The global aseptic sampling market is divided into type, technique, application, and end-user. By type, the aseptic sampling market is classified into automated aseptic sampling and manual aseptic sampling. Manual aseptic sampling is further divided on the basis of type (traditional and single-use) and product (bags, syringes, bottles, and accessories). Manual aseptic sampling dominated the aseptic sampling market in 2018, due to its extensive use of and the high cost of automatic aseptic sampling instruments. By technique, the aseptic sampling market is divided into at-line sampling, on-line sampling, and off-line sampling. In 2018, off-line sampling dominated the aseptic sampling market globally, owing to its growing usage by the manufacturers for sampling. The application segment of the aseptic sampling market is divided into the downstream and upstream process. The upstream process sub-segment is projected to dominate the application segment of the aseptic sampling market over the estimated period. The upstream process is the initial stage of any biotechnological process. Contamination at this stage may affect the entire product. Therefore, the use of aseptic sampling is important at this stage, which is projected to drive the upstream process segment globally in the future. By end-user, the aseptic sampling market includes biotechnology and pharmaceutical manufacturers, research and development departments, contract research and manufacturing organization, and others. The increase in the research activities across the biotechnology and pharmaceutical sector and rise in the number of the biotech and pharma firms in the emerging economies is likely to fuel the growth of the biotechnology and pharmaceutical manufacturers segment. By region, Europe is anticipated to dominate the global market for aseptic sampling in the upcoming years, owing to the growing investments made by the government and the growing number of companies in the research and development activities for the launch of biopharmaceutical products. The Asia Pacific aseptic sampling market is anticipated to show the highest growth rate in the future, owing to large-scale investments made by the key players due to the increasing research activities in developing countries, such as China and India. Some key players of the global aseptic sampling market are QualiTru Sampling Systems, Sartorius Stedim Biotech, GEA Group, Danaher Corporation, Keofitt, Thermo Fischer Scientific, Saint Gobain, Trace Analytics, Merck, Lonza, and Gore & Associates.